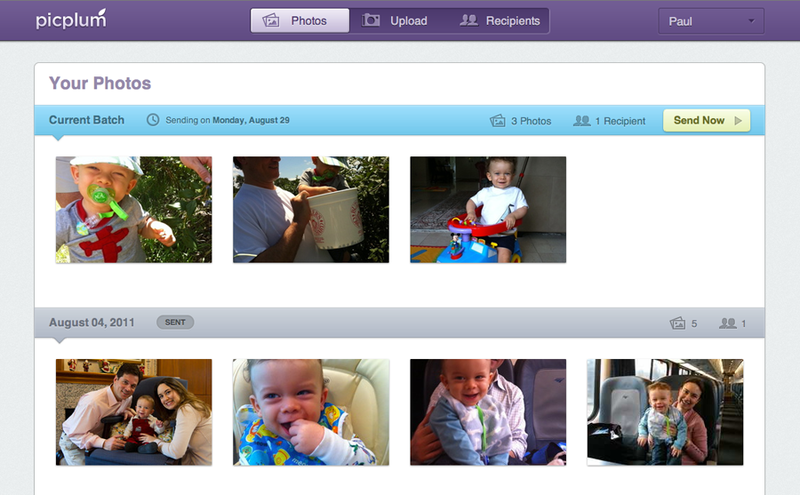 PicPlum is a new photo-sharing startup which aims to make the curation, printing and mailing of physical photos easier than before. The service, founded by Paul Stamatiou and Akshay Dodeja, is targeted towards parents who want to send out printed photos of their children to friends and family. However, unlike the photo-printing powerhouses, Shutterfly and Snapfish, the idea isn’t to print out all your digital photos as cheaply as possible. 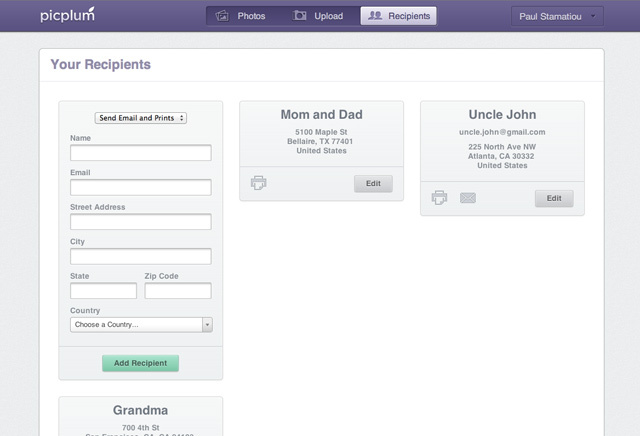 With PicPlum, it’s about enhancing the overall experience of sending and receiving photos by mail. 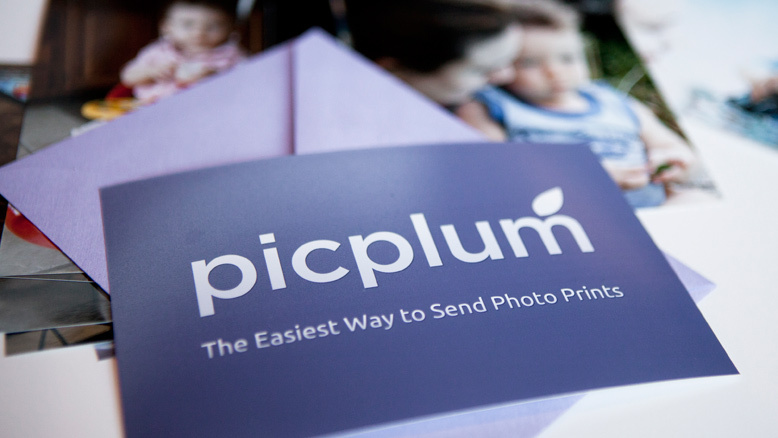 PicPlum encourages its users to select only their best photos, which are then printed using a high quality chemical process and packaged into attractive envelopes prior to shipping. The end result is something more beautiful and more engaging than anything you would receive from a traditional print shop. The service has another key benefit, too – it’s automated. Every month, a new batch of photos is sent out for you through the service, without any effort on your part. Although there is a pay-as-you-go option for those who don’t care for subscription services, the monthly option is the better deal. For $7 per month, you can choose 15 photos sent to one address. For another $7, you can choose a second recipient. And if you want to add extra photos to the batch, it’s $0.50 each. Pay-as-you-go users, meanwhile, pay $0.50 per photo plus shipping ($1.50 in the U.S, and rates may vary for international orders). PicPlum is offering a special to TechCrunch readers which gives you a 2nd recipient for free, in addition to the one-month free trial. Click here to use the TechCrunch promo code. To be fair, this service is 5 times more expensive than those from larger companies, like Shutterfly or Snapfish, which typically charge 9-cents per photo. Either of those companies could easily launch something similar, and undercut PicPlum on price. But what sets PicPlum apart at present is the automation. Throughout the month, you selectively email in your best photos, or upload them directly to the site. You don’t have to remember to do anything else – which, as any parent will tell you, is a huge plus. There’s also something to this idea of curation. Thanks to the ubiquity of digital cameras and camera phones, it’s easy to accumulate large collections of photos, containing hundreds of photos, if not thousands. Family and friends (as much as they love your little one! ), don’t really have the time to sift through those online photos to select those they wish to print. So instead, you select the best photos and the rest is handled for you. The company’s founders have previous startup experience. Stamatiou co-founded mobile notifier platform Notifo, and Dodja co-founded music startup Mugasha. PicPlum acquired the assets of a previous Y-Combinator company PicWing, and took over its printer relationship and initial user base. The company currently has $150,000 in funding offered by SV Angel and Yuri Miller to all Y-Combinator startups earlier this year. The founders say they are beginning their fundraising now, and will be looking to hire soon.